The Bellatrix Astronomical Observatory, as a permanent facility, started its activities on Nov. 1997, when a C11- f/10 OTA and a Losmandy G-11 mount were permanently installed under a sliding roof in Ceccano (FR), Italy. The astronomical experience and the activities of the author, however, are definitely older: the first telescope used there, a small 60mm refractor, dates 1983 and helped discovering the Sun, the Moon, a few double stars and some deep-sky objects. In 1985, while waiting for comet Halley, a new telescope arrived, a 150mm-f/5 Vixen Super Polaris R-150S: it was a very good one, with technologically advanced electronics. It made possible to start a very intensive observing season, which included a large number of deep-sky objects: the first observing reports started to be published on the Italian magazine “l’Astronomia”. In 1988, astrophotography was introduced: all the films and prints were personally developed, to achieve the best results. Special films, like the hypered Technical Pan 2415, were commonly used and the images were routinely hosted on magazines and books. After 5 years, in 1993 the author started experimenting the first CCD imaging systems. The possibilities of this revolutionary techinque, suitable of serious scientific applications, looked truly impressive. Since then, astrophotography was dismissed. From 1993 to 1996 the observing activities were stopped, mainly because the author was not at the site, being a student in Astrophysics attending the University of Rome “La Sapienza”. In 1995 something happened: on July 22, Alan Hale and Thomas Bopp discovered a comet, destinated to leave a deep sign in the astronomical history: it promised a memorable show for the Spring of 1997. 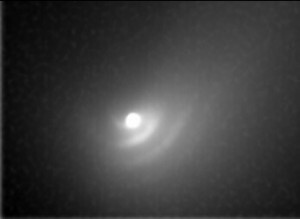 The perspective of such a scientific event pumped new life into the activities of the author, who contacted the Santa Barbara Instrument Group (SBIG) for the loan of one of their CCD cameras and contribute to the study of that new comet. In Dec. 1996 Richard Schwartz (SBIG) arranged the loan by means of their Italian distributor Auriga of a ST- 7 camera. It was intensively used since the very beginning and during the first half of 1997 it provided excellent results, of course including the comet Hale-Bopp (its images were published by NASA and JPL on their own websites). Just to make all those images available to the community, on 30 Apr. 1997 the author launched the Bellatrix Observatory website, becoming one of the most authoritative and popular astronomical websites in Italy. On 1 Aug. 1997 the first great astronomical discovery: a new Mira variable star in Vulpecula, very close to the famous M27 “Dumb-bell” Nebula. At that point, a larger telescope (A C11 + Losmandy G11) arrived, able to further support the scientific needs of what, since Nov, was going to become the Bellatrix Observatory. An impressive upgrade! Since then, it is almost impossible to mention the many developments occurred. 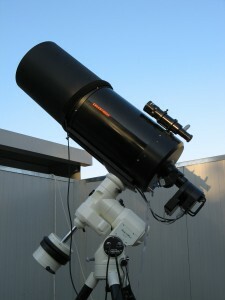 In 1998 the observatory became the Italian station of the Center for Backyard Astrophysics (Columbia University, New York) and of the VSNET Collaboration Team and a new field, destinated to have a great importance in the scientific carrier of the author, was started: the observation of asteroids and comets, especially near-Earth objects (NEOs). About 20 asteroids were discovered (the first on Feb. 1998), many of them now named. However, the scientific activity is quite wide, ranging from asteroids to variable stars, from comets to transient phenomena. Over the last 10 years, the Bellatrix Observatory had several very intense periods like July 2001, when the famous cataclysmic variable WZ Sge erupted, promoting the largest observing campaign ever seen (with the Observatory being the leader). To date, the main activity are asteroids and variable stars photometry, the photometric observations of transits by exo-planets (the autor is the co-discoverer of exoplanets XO-2b and XO-3b) and optical and spectroscopic follow-up fi possible supernovae. They add to comets and astroids astrometry. On Jan. 2006 the whole instrumentation was fully upgraded, only keeping the C11 OTA. It was installed on a robotic Vixen New Atlux Mount, which was controlled with its Skysensor 2000PC thanks to a software suite by Software Bisque: the telescope was remotely accessible from any place on the planet via the internet. It was the birth of the Virtual Telescope Project, officially started on 20 Aug. 2006! It was just the beginning of an amazing adventure. In 2007 a new structure replaced the one hosting the telescopes, making possible to potentially install a second, large scope. Soon after, the 11″ tube was installed on a Paramount ME robotic mount, a giant leap into robotic astronomy; another C11 was hosted on the New Atlux mount. Later, a C14 OTA was installed on the Paramount and for three years the staff has been looking for a venerable, prestigious instrument; finally the choice was a Planewave 17″-f/6.8 Corrected Dall-Kirkham Astrograph on another Paramount ME robotic mount. 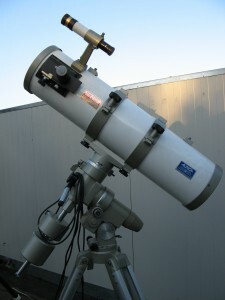 It was one of the very first scopes of this kind to be introduced in the world. So, the final setup consists in the C14 and PW17 OTAs, both sitting a fully robotic Paramount ME mount. Both scopes use a SBIG CCD camera (a ST8-XME on the C14 and a STL-6303E on the PW17, respectively). While both are used to get amazing images and great scientific data, also thanks to the great seeing of the site (mean value is 1.8″), the two telescopes have been fine tuned for slightly difference applications: the C14 is able to perform very high precision photometry (within a few millimags), while the PW17 offers a wide highly corrected field of view for imaging and detection of very faint sources, ideal for astrometry of faint nar-Earth Asteroids and comets. They sport color, narrow-band and photometric filters to match the needs of professional astronomers and the dreams of amateur astronomers, both advanced and novice.